In commemoration of the birth of Scientology Founder L. Ron Hubbard in his centennial year, Inglewood, California, has designated March 13 as L. Ron Hubbard Day. 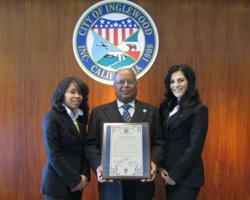 Inglewood City Councilman Ralph Franklin presented a special commendation in City Council chambers March 8, to the Church of Scientology of Inglewood. The Public Information Center of the newly opened Church of Scientology of Inglewood at South Market Street in Inglewood, and the Church of Scientology Community Center at the intersection of 81st and S. Vermont Street in South Los Angeles, include extensive multimedia presentations on the life and legacy of L. Ron Hubbard. The Information Centers further provide an overview of the many Church-sponsored humanitarian programs active in Inglewood and in cities the world over. The Scientology religion was founded by American author and humanitarian L. Ron Hubbard. The first Church of Scientology was formed by Scientologists in Los Angeles in 1954. Today the religion spans the globe with more than 10,000 Churches, Missions and affiliated groups across 167 nations.